Note that the main center image is of the 2018 superspeedway car configuration, with the outline of the current superspeedway configuration superimposed over it for comparison. 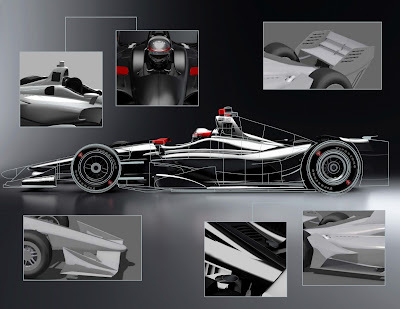 Secondary images in the upper right and lower left show concepts for the rear wing and front wing in the 2018 street course/road course/short oval configuration. The images are still not the final product we will see on track for testing this summer, but rather give a more focused idea of the direction the engineers and designers are taking.